Caracalla (born 188, reigned A.D. 211-217), one of the bold and brutal Roman emperors who ruled in the early 200s A.D., murdered his brother in his ascent to power and later was himself assassinated. In this marble bust, he wears a soldier's cuirass and toga. Turning his head to the left, he focuses on something that apparently does not meet with his approval. He flares his nostrils and furrows his brow, movements perhaps intended to suggest his ferociousness. In the 1700s, Caracalla's likeness was known from a bust in the Farnese collection in Rome and then Naples, believed to date from the 200s. 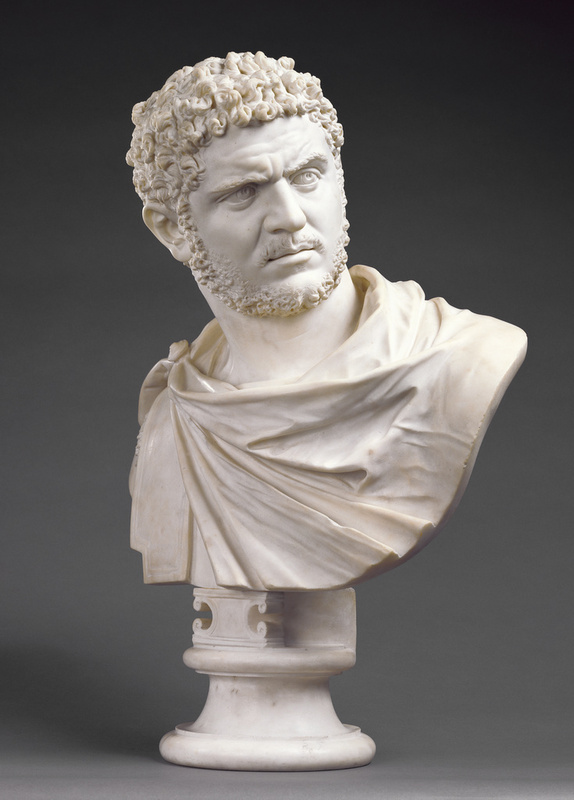 Sculptor Bartolomeo Cavaceppi drew on this famous prototype for his marble bust of Caracalla. Carved during a period in which collectors bought sculptures all'antica, this bust was probably intended for an English collector's Neoclassical gallery. Cavaceppi was best known for his restorations of antique sculpture rather than for his rare original works, such as this one. He demonstrated his familiarity with classicism through his skillful drillwork in the antique manner, seen in the handling of Caracalla's beard and hair. 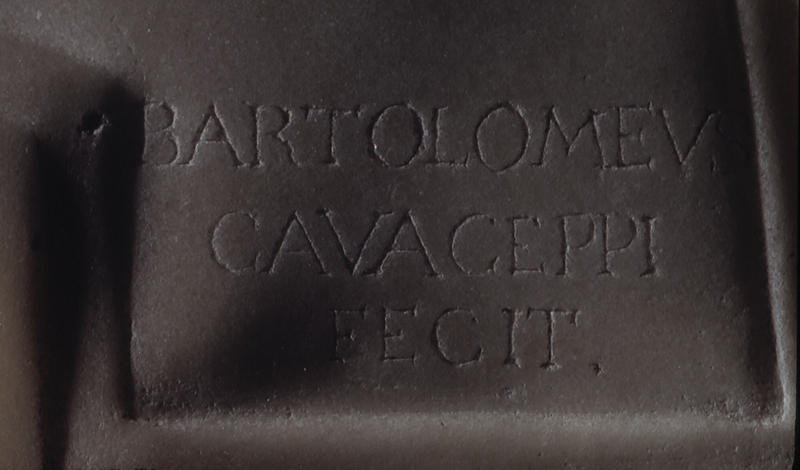 This bust is one of Cavaceppi's rare signed works. Daniel Katz Ltd. (London, England), sold to the J. Paul Getty Museum, 1994. Sotheby's Art at Auction: The Art Market Review, 1993-94 (London, 1994), p. 194. "Acquisitions/1994." The J. Paul Getty Museum Journal 23 (1995), p. 121, no. 100. Sotheby's, London. Sale catalogue. December 7, 1995, under lot 96. Fusco, Peter. Summary Catalogue of European Sculpture in the J. Paul Getty Museum (Los Angeles: J. Paul Getty Museum, 1997), p. 15, ill.
Bassett, Jane, and Peggy Fogelman. Looking at European Sculpture: A Guide to Technical Terms (Los Angeles: J. Paul Getty Museum, 1997), p. 25. Bowron, E. Peters, and J.J. Rishel, eds. Art in Rome in the Eighteenth Century, exh. cat. (Philadelphia: Philadelphia Museum of Art; Houston: Museum of Fine Arts, 2000), p. 241, no. 119, entry by Peggy Fogelman. Fogelman, Peggy, and Peter Fusco, with Marietta Cambareri. Italian and Spanish Sculpture: Catalogue of the J. Paul Getty Museum (Los Angeles: J. Paul Getty Museum, 2002), pp. 300-305, no. 38. Fogelman, Peggy, and Peter Fusco, with Marietta Cambareri. Italian and Spanish Sculpture: Catalogue of the J. Paul Getty Museum Collection (Los Angeles: J. Paul Getty Museum, 2002), pp. 300-305, ills. 38-38A, 38C-38F. Faroult, Guillaume, et al., eds. Antiquity Revived: Neoclassical Art in the Eighteenth Century, exh. cat. (Houston: Museum of Fine Arts, with Musée du Louvre and Gallimard, 2011), p. 41, no. 3, ill., entry by Edgar Peters Bowron.